Located in Parkdale, just minutes from the heart of Charlottetown, the Murchison Centre provides meeting and event services for groups of 20-400. Built in 2007, this attractive professional building is the ideal space for your business, government or non-profit agency to host special events, staff training, meetings or workshops. 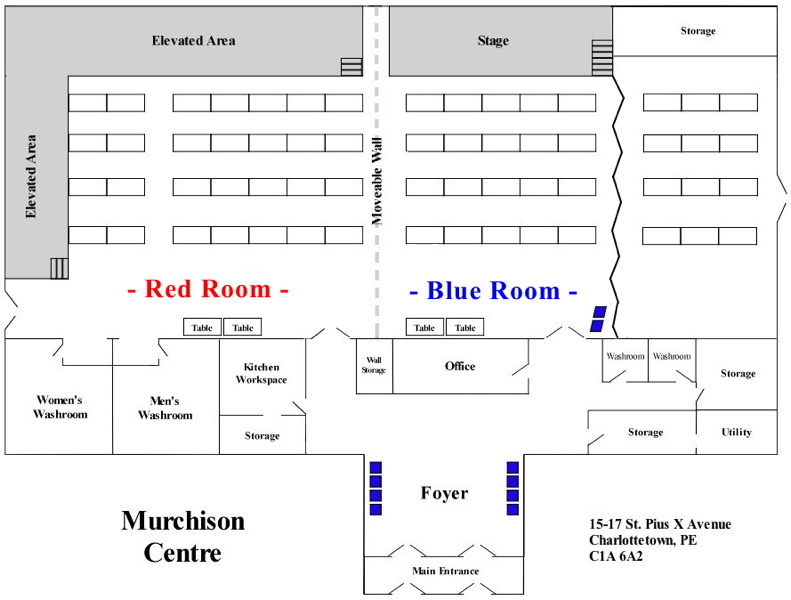 Conventions and conference organizers looking for additional space will find that Murchison Centre is a professional, practical and convenient option. 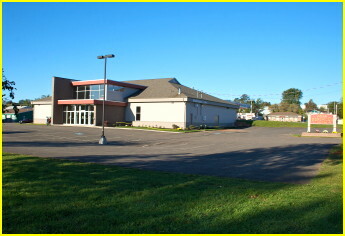 Events booked at this facility support the ongoing programs of The Canadian Mental Association of PEI. With two large rooms, a third (Purple, a very large) room set up by combining Rooms 1(Red) and 2(Blue), plus a spacious, attractive, foyer, our staff can provide you with variable room configurations throughout the course of a day. Our soundproof, moveable wall is the perfect touch to create a practical space for smaller groups, meetings and workshops and large conferences. Our flexible beverage service and open catering options mean that you don't have to worry about such services at your event. We can provide coffee breaks or allow you to choose your own caterer. If you want to bring your own food, then we provide you with the freedom and space to do that too! Murchison Centre is the ideal space for almost any type of event or meeting. The cost to rent our facility and services is very competitive. To predetermine what your rental costs will be (approximately), just click on this rental cost link or rental fee tab shown at the top of each page of this website. Go to our Event Calendar (Murchison Events menu option) to see if the preferred date and time for your planned event is open. You also can use the little calendar (upper LHS of every page) to check out planned activities for the coming months. If you're uncertain of the fit, or want to double-check, please contact us directly. Fill out our Rental Form to tell us how we can best meet your space and refreshment needs. Once the form is submitted you will see a page confirming that the form has been sent. Our staff will be in touch with you shortly after and once you book a space it will be entered into, and show up on, our Event Calendar. For more information or to confirm your space, please contact Melanie Saunders at 902-628-3655 or send an email by clicking the link at the bottom of this page. Please leave a detailed message if no-one is there to take your call and we will return your call as soon as possible. 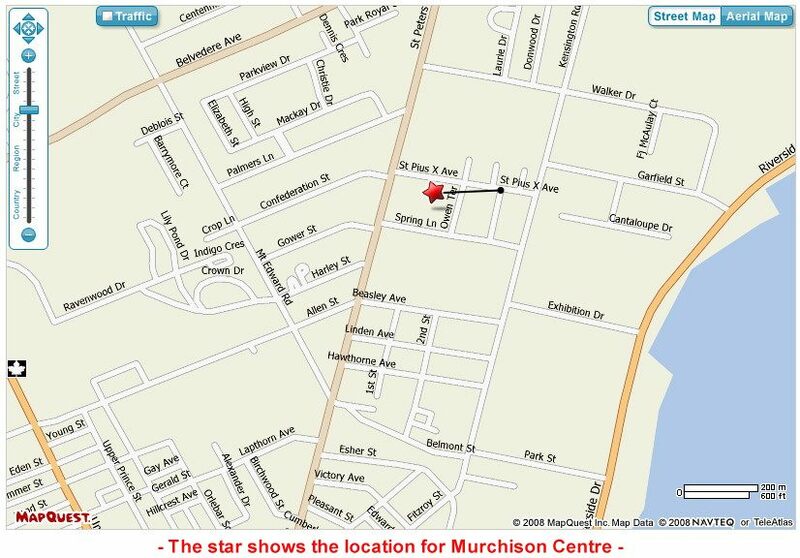 Trouble locating Murchison Centre? Click on the map link.